Can fishes walk on land? Sounds crazy! But these two fish can. 1. Mudskippers are amphibious fish, presently included in the subfamily Oxudercinae, within the family Gobiidae (gobies). Recent molecular studies do not support this classification, as oxudercine gobies appear to be paraphyletic relative to amblyopine gobies (Gobiidae: Amblyopinae), thus being included in a distinct “Periophthalmus lineage”, together with amblyopines. 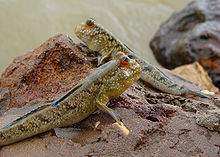 Mudskippers can be defined as oxudercine gobies that are “fully terrestrial for some portion of the daily cycle” (character 24 in Murdy, 1989). This would define the species of the genera Boleophthalmus, Periophthalmodon, Periophthalmus, and Scartelaos as “mudskippers”. However, field observations of Zappa confluentus suggest that this monotypic genus should be included in the definition. These genera presently include 32 species. Mudskippers use their pectoral fins and pelvic fins to walk on land. They typically live in intertidal habitats, and exhibit unique adaptations to this environment that are not found in most intertidal fishes, which typically survive the retreat of the tide by hiding under wet seaweed or in tide pools. The Anabantidae are a family of perciform fish commonly called the climbing gouramies or climbing perches. The family includes about 34 species. As labyrinth fishes, they possess a labyrinth organ, a structure in the fish’s head which allows it to breathe atmospheric oxygen. Fish of this family are commonly seen gulping at air at the surface of the water. The air is held in a structure called the suprabranchial chamber, where oxygen diffuses into the bloodstream via the respiratory epithelium covering the labyrinth organ. This therefore allows the fish to move small distances across land. Of the four genera, Anabas is found from South Asia (they are called chemballi (Malayalam: urulan sugu/Karippidi) in Kerala, kau (odia) in Odisha, India, kawaiya in Sri Lanka), east to China and Southeast Asia. The remaining three genera are all restricted to Africa. They are primarily freshwater fishes and only very rarely are found in brackish water. As egg-layers, they typically guard their eggs and young. Climbing gouramis are so named due to their ability to “climb” out of water and “walk” short distances. Even though it is not reliably observed, some authors mentioned about they having a tree climbing ability. Their method of terrestrial locomotion uses the gill plates as supports, and the fish pushes itself using its fins and tail. For more of these amazing animals please hit that like button! Oh! I went to that aquarium before! Fascinating! Animals evolve amazing ways to survive in their environments, and this is one of the most amazing ones. I think it would be a bit startling to see a fish walking on land! Watch the video to see them walk. Thank you so much for commenting!